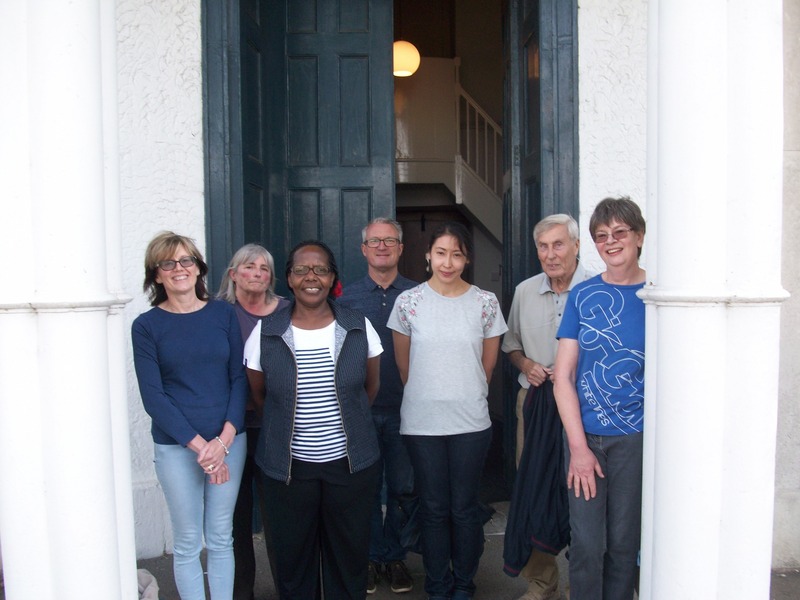 St Andrew’s and South Ockendon bell ringers entered 2 teams for a striking competition designed to encourage new bell ringers to take part. Each team consisted of 6 ringers of which the majority were new recruits having never taken part in such a competition before. The competition was held at Dagenham Parish Church with 4 teams from the SW District of Essex taking part. Each team had to ring for between 5 and 8 minutes whilst the conductor moved the bells to different positions (Call Changes). Despite lots of nerves and apprehension, both of our teams successfully completed their test pieces and finished in 2nd and 4th places, losing out to Epping in 1st place. All have resolved to take part again next year. L – R: Rosemarie Edwards, Terry Thornhill, Rose Kaziro, Steve Sampson, Michelle Long, John Stephenson and Jane Harper. During World War I, men from the New Zealand army were stationed at Grey Towers in Hornchurch where their hospital was based. Among them were 150 men from the Pacific Island of Niue who fought in France, with the allies, in the Battle of the Somme. Four of them died in Hornchurch of illness during June 1916 and their graves are in St Andrew’s Churchyard. As part of the 100th Anniversary of the Battle of the Somme commemorations, a party from the Niue Return Services Association came to St Andrew’s for a special service of Remembrance and to visit the graves of their fellow countrymen. 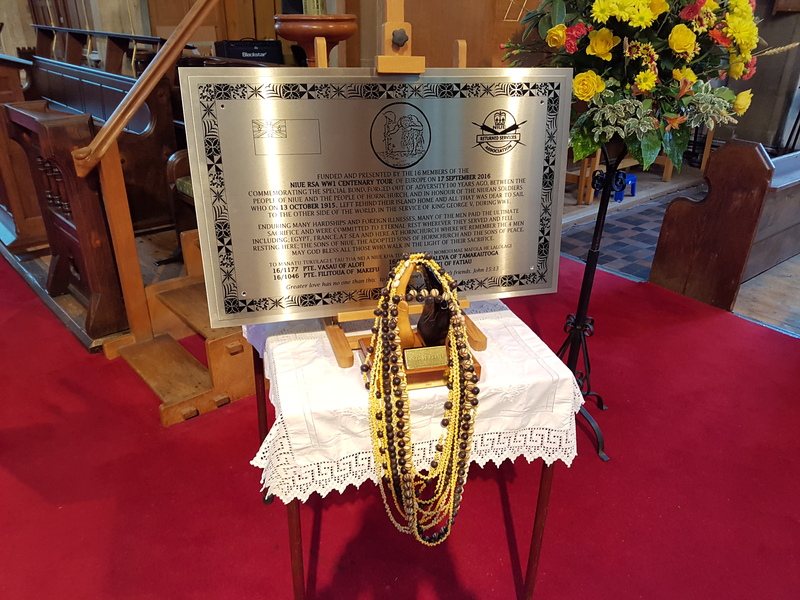 A quarter peal was rung prior to the service and a commemorative plaque, shown below, is to be installed inside St Andrew’s Church. Prior to a service commemorating the 100 years since soldiers from The Niue Islands fought alongside British troops on the Western Front in World War I. Four such soldiers have graves in St Andrew’s churchyard, having died at a convalescent hospital based in Hornchurch at that time. On 9th July 2016, St Andrew’s bell ringers took part in The Essex Association striking competition finals at Mistley (near Harwich). There were 11 teams taking part from all over Essex and each team had to ring 240 changes of any method. This means concentrating hard for about 8 or 9 minutes whilst the judges listen for any irregularities (faults) in the ringing, for example, when 2 bell ‘clash’ together. Each team is then given a total number of faults and the team with the least faults wins. Our team performed well, registering 51 faults out of a possible 240 and finished 7th out of the 11 teams taking part. On Saturday 11th June, a largely Essex band successfully completed a peal of Plain Bob Royal as part of The Queen’s 90th birthday celebrations. All 10 bells were rung to Plain Bob Royal and the bells were ringing for 3 hours and 12 minutes. The peal also marked the 95th birthday of The Duke of Edinburgh. Rung as part of H M The Queen’s 90th birthday celebrations. Also to mark the 95th birthday of The Duke of Edinburgh. First of Royal – 4.